Contemporary Chalet with wrap around porch offers something for every season. Lake Sunapee beach is accessible at the end of the property, and Mt. Sunapee is 2/10 of a mile up the road. Additonally, the State beach is 1/10 of a mile away, and allows for easy boat launching and swimming. A family pass for the State Beach comes with the property. The house features cathedral ceilings over a large open concept living room, dining room and fully equipped kitchen with new stainless and new granite countertops. Beautiful hardwood floors throughout the main living area, and the bedrooms are carpeted. The oversized master bedroom is on the top floor overlooking the living area. There is a twin trundle in the large room which is great for young families. Additionally, it has it's own private bath. Two other bedrooms and a bath round out the main floor. There is a second living area on the ground floor. The finished heated basement has a pool and fooz-ball table, 52 inch flat screen and wii console. There is also a ski drop area, with tiled floor. A pair of sliding glass doors open up to a wrap around porch with meadow and peek-a-boo views of Lake Sunapee. Take both of the two kayaks out, and explore the lake. The home is nestled on close to 3 private acres. This property is a short walk away to a shared beach, and a short bike ride or walk to the State Beach. Newbury Harbor is just up the road dotted with restaurants and shopping. Additionally, the town of New London is a short drive, and has many fine restaurants and cultural activities. For the cold weather enthusiast, Mount Sunapee is just 2/10 of a mile up the road, offering competitive trails for both skier and snowboarder. When the ground isn't snow covered, the resort is transformed into an adventure park. Peek-a-boo lake views in summer from main room and master balcony. Clearer view in winter. Free local calling, long distance calls are chargeable, with charge being deducted from your deposit. Stainless in kitchen, additional one in garage off basement. Dishwasher, microwave, gas range, refrigerator. Wrap-around deck with meadow and peek-a-boo lake views. We had a wonderful stay. The facility is great, especially for small grandchildren. A great place. We spent a couple of days here as a family getaway (grandparents, parents and 2 boys), and it was a lot of fun. House had everything we needed, we were able to walk to the lake beach and the mountain was a short drive away. The boys particularly loved the game room in the basement! Would stay here again for another NH vacation! The property is great. Have stayed there 5 or 6 times now. Close to area attractions and secluded in the trees. All the games and stuff make it great even when it rains. Has everything you could ask for a vacation rental at a great price too. Very nice. Aimee was very sweet and the amenities of Lake Sunapee were so close. House was well equipped and very peaceful. Great spot. Interior was lovely, just as pictured and described. Delighted to find the place extremely well stocked with kitchen items, kids toys, etc. we loved the game room and had a blast with the wii! Two less satisfying aspects were the proximity of the lake and the check-out process. This house is NOT lakefront. There is a long, muddy and confusing path that leads to some kind of a small section of a shared beach that we were unable to correctly locate despite the owners having left a map. We kept going to the wrong part of the beach and being told by neighbors that it was private. That said, the beautiful state beach is just down the road and the season pass was a great addition and made coming and going a breeze. The house is also a two-minute drive from my Sunapee adventure park - so much fun! We had some confusion around check-out times (told 11am but this ended up being a typo by the owner and it was actually 10am) and the clean-up process for checkout here is quite extensive - getting all trash to the dump, cleaning dishes and emptying the dishwasher and fridge and laundering and remaking the beds wasn't manageable given the early checkout time! And they weren't kidding, the cleaners were there at five minutes before ten waiting for us to clear out!! I am sorry that you misunderstood the property information. I am a little confused though, since this is the first I’ve heard of your dissatisfaction in all of our correspondences. I hope to address your concerns below. First, the property description on the website does not list the house as “lakefront”. Nor do we show any pictures of the beach to suggest that the house is lakefront. 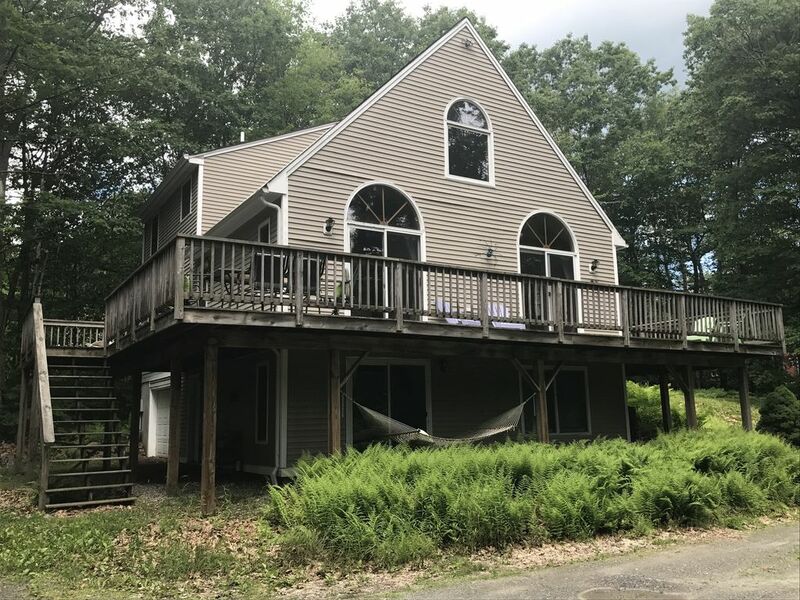 What the overview states, is that “Lake Sunapee beach is accessible at the end of the property” and show a picture of the path which in fact leads you to the beach at the end of the property as stated. I unfortunately have no control on the amount of rain this summer, which contributed to the path being “muddy”. There are private beaches next to ours, which are clearly labeled as such. We provide a map to the common beach, just to avoid such confusion. Glad you enjoyed the state beach, and used the season pass we provided. I explained the common beach to you in emails through VRBO, and suggested the State Beach given the age of your children. I looked back on our correspondence, and I stated, “I noticed your children are ..., we are right next to the state beach, and include a pass to the park. It is great for young children. There is also shared beach you can walk to, the boat traffic is a little heavy there though.” I don’t know how that is “misleading” as you claim. I do apologize the typo on checkout time. You emailed us to confirm time, and that was all I heard from you. If more time were needed, I would have contracted our service. I include the transfer station schedule in the binder provided. Additionally, we give tenants the option of paying a fee for garbage removal if you can’t make it to the station. It is common protocol to clean out the fridge upon leaving, as we did on our vacation rental. So far as laundry is concerned, we have the cleaning people that come to make the beds as part of their service. We leave a binder with instructions that states, “Bed linens should be left clean and on the beds”, not made. “If time does not allow, please leave in the washing machine in the basement (without starting the machine).” Again, I would hope if there were any confusion that you would have contacted us, as you did about checkout time. Lastly, when I asked if you had any questions when you booked, you stated, "No specific questions - we'd love to reserve for that week!” I wish you had asked so as to avoid any confusion. We enjoyed our stay at your home. Very clean and spacious. Very close to the lake and plenty of indoor activities. Leaf-looking in the fall, Downhill skiing at Mount Sunapee, Cross-country skiing on numerous cross-country trails. Also, mini golf and zip lining at Mount Sunapee's adventure park! Snow plowing not included in winter months, but have a plower who is local and familiar with the house that we can recommend.